Paul and I hold our Limestone class very close to our hearts. As we look back on our time at Limestone, we feel that each and every student has taught us more than we could have imagined. It is with an overwhelming feeling of nostalgia that we highlight our past year with this wonderful class. Our first day at Limestone: we had no idea what to expect. We taught nutrition and ways to eat healthy on a budget. We were nervous but Tammy (the teacher in the classroom we visit each week) and the students were welcoming and had a lot of good questions for us- some that even the health expert Paul had to look up! Our first day taught us that we need to prepare background information on every lesson we teach at Limestone, because are were going to have questions (and excellent questions at that)! Another highlight of the year was when we discussed positive thinking and positive self-talk, an intro to mental health. It became apparent that we were perhaps "preaching" the importance of positive thinking with out realizing many of the students heard this all before - in therapy. We listened to some heartfelt stories we will never forget and we also learned a lot about preaching vs. peer educating. We came back from this lesson with a new spin on teaching, discussion-based learning and encouraging students to write down their personal stories rather than share them in front of others. This helped drive the discussion in a positive direction, rather than dwelling on hardships. This class is so special because even though the students are all different ages and backgrounds, they all respect and care for each other. We spent many lessons discussing ways to improve one’s mental health, which incorporated a lot of physical health practices. They really appreciated learning simple tips and offered advice to whom ever was speaking about a challenge they faced in their every day lives. They even helped me quit my incessant diet coke drinking! Paul and I found it so refreshing to see such cooperative teamwork and it is quite clear that Tammy, the teacher, has a lot to do with this. Tammy is a remarkable person because with her optimism, encouraging words and open-mindedness, she has a master key to each mind in her classroom. Her students trust her, appreciate her and without doubt, respect her. We are so grateful for all the teaching skills Tammy passed on to us, whether she intended to or not! Thank-you Tammy. For our last lesson, we decided to put our health tips into action! We brought a huge canvas and painting supplies and let the students paint whatever they felt in an effort to provide the students with a healthy outlet for their emotions. They loved it. 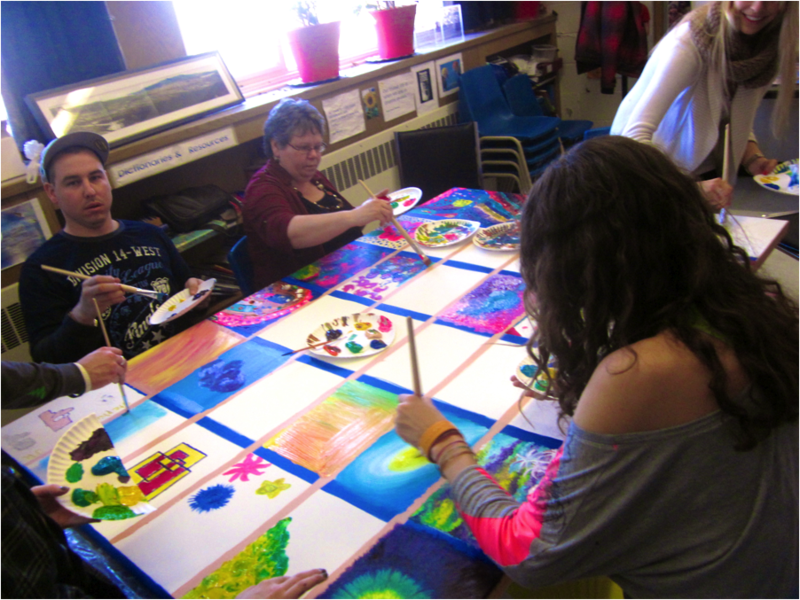 They gained confidence with each brush stroke and commented on how they felt like a kid again. It was funny to see them so quietly concentrated when they are usually a very talkative class! Word of our outreach project spread through the halls and some other teachers and staff members joined in. It was the perfect day. We will miss these students and Tammy more than we can put in words and we thank Maddy and Madison for the special opportunity to teach at Limestone.